Orioles are beautiful and highly desirable backyard birds. By offering the right foods and using feeders suitable for these large songbirds, you can easily enjoy these brilliant orange, yellow, and black birds all through the spring and summer. Specialized oriole bird feeder designs are available that accommodate only the foods orioles prefer, therefore enticing these birds for a meal without competing with other birds. Nectar feeders with wider ports for large bills and perches for these songbirds are popular, as are small dishes for offering jelly or mealworms. Feeders with spikes to securely hold orange or apple halves are also popular oriole feeders, and many feeder designs incorporate all three: nectar reservoirs, jelly dishes, and fruit spikes. Chunks and wedges of fruit can also be offered in platform, cage, or tray feeders, and jelly can be offered in any small dish or even directly from the jar. If you haven’t been feeding orioles specifically but have already noticed them in your yard, they may be attracted to any hummingbird feeders you have available. The classic hummingbird nectar recipe of four parts water to one part sugar is also attractive to orioles, but they will prefer nectar feeders with larger ports and perches because of orioles' bigger size. 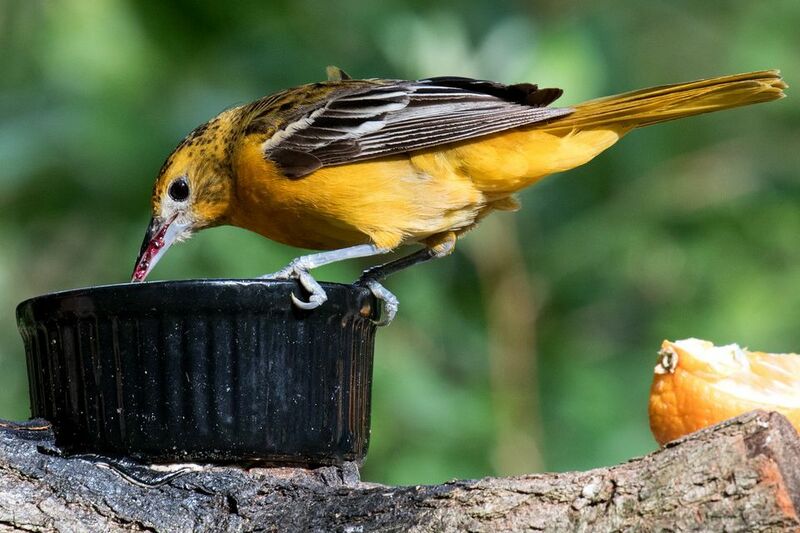 Orioles will also eagerly sip less sweet nectar, and making oriole food with a 5:1 or 6:1 ratio of water to sugar is suitable and can be more economical when trying to appease these birds’ hearty appetites. Many commercial oriole nectars also use orange dye to help attract the birds. Just like with hummingbirds, however, the dye is unnecessary as many oriole nectar feeders have orange bases and ports that will attract the birds just as easily without the risk of added chemicals. Jelly is one of the most effective oriole foods you can offer. Smooth grape jelly is best, but the birds will also take orange marmalade or red cherry, strawberry, apple, or raspberry jams or jellies. Offer jelly in small dishes, in a hollow orange rind, or smeared on an orange half and the orioles won’t be able to leave it alone. Do not, however, offer sugar free jellies or any jelly made with sugar substitutes. It is the sugar that gives the birds the necessary energy and calories they need, and artificial sugars may be toxic to birds. Ideally, organic jellies are best. When orioles are visiting feeders frequently, it may be best to offer jelly only in limited quantities. This will ensure the birds seek out a wider variety of food sources for more balanced nutrition, since jelly alone does not provide adequate protein or other nutrients. Instead, consider offering crushed grapes as a more nutritious jelly alternative along with other oriole-friendly foods. Avoid spraying pesticides that will remove the insects these birds eat. Depending on the oriole species, insects may be up to 90 percent of their diet, particularly during nesting season when young birds require more protein for healthy growth and development. For a ready-made food source, plant shrubs and bushes that produce berries orioles will eat. Blackberries, elderberries, blueberries, serviceberries, raspberries, mulberries, and huckleberries are all good choices. Plant a variety of nectar-producing flowers in your garden to give orioles another natural food source. Many orioles will be attracted to the same sweet flowers that attract hummingbirds, including petunias, honeysuckle, and bleeding hearts. Protect oriole feeders from ants by installing ant moats with each feeder, but do not use oil-based products smeared on poles or feeders to keep ants away. These products can coat a bird’s feathers and make flight and preening more difficult. Do not offer fortified orange juice or orange flavored drinks or sodas in place of oriole nectar. These products do not have the necessary sucrose for the birds and contain many preservatives and other chemicals that can be harmful. Keep nectar, fruit, and jelly feeders fresh by replacing the contents every few days and washing the feeders when necessary. In the hottest weather, feeders may need to be cleaned daily to avoid mold and spoilage that can be toxic to orioles. Just as different people have different feeding preferences, so do different birds, even of the same species. Try out a variety of foods and feeder types when feeding orioles, and you’ll soon have these beautiful birds dining regularly in your yard.